Prewashed Indian prefold cloth diapers are finally here! Customers have been asking for this for a while now and I finally found a way to make it practical. These are the same premium 4x8x4 100% cotton unbleached diaper service quality Indian prefolds you have come to know and love. We have just taken some of the work out of them for you. They have been prewashed several times in an unscented cloth diaper safe detergent (we generally use either Allen's or Rockin Green for prewashing these diapers). Because the are prewashed, I can not accept returns. There is no way for me to ensure that a diaper has not been used once it has been washed. Please make very sure you are buying the right diaper before purchase. I recommend that you wash these one time in your own detergent just to be on the safe side, but if you wish, these are usable striaght from the package. 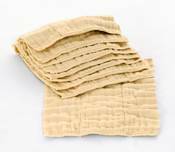 These Indian prefold cloth diapers will increase in absorbency for a few more washes, as it takes about 8 washes for maximum absorbency (these have been washed 4 times). 4x8x4 Infant Premium size is about 10 1/2 x 14 inches (was 12x16) 4x8x4 Regular Premium size is about 14x19 inches (was 14.5x22) Priced just two dollars higher per dozen, to cover our utilities. Sold in packages of 6 prefold cloth diapers. We recommend 24-36 diapers for a full stash. You will likely want a minimum of one cover for each 6 prefolds.